Description: In Cosmology and Fate in Gnosticism and Graeco-Roman Antiquity, Nicola Denzey Lewis dismisses Hans Jonas' mischaracterization of second-century Gnosticism as a philosophically-oriented religious movement built on the perception of the cosmos as negative or enslaving. A focused study on the concept of astrological fate in �Gnostic� writings including the Apocryphon of John, the recently-discovered Gospel of Judas, Trimorphic Protennoia, and the Pistis Sophia, this book reexamines their language of �enslavement to fate (Gk: heimarmene)� from its origins in Greek Stoicism, its deployment by the apostle Paul, to its later use by a variety of second-century intellectuals (both Christian and non-Christian). Denzey Lewis thus offers an informed and revisionist conceptual map of the ancient cosmos, its influence, and all those who claimed to be free of its potentially pernicious effects. 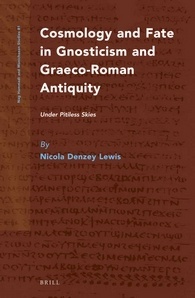 Citation: Timothy Pettipiece, review of Nicola Denzey Lewis, Cosmology and Fate in Gnosticism and Graeco-Roman Antiquity: Under Pitiless Skies, Review of Biblical Literature [http://www.bookreviews.org] (2014).